Cobham SATCOM's SAILOR 60 GX. [Satnews] Cobham SATCOM is showing its new 60cm Ka-band VSAT antenna systems to the US boating community for the first time at Fort Lauderdale International Boat Show 2015 (Electronics Pavilion 368-370). The all-new SAILOR 60 GX and SAILOR 600 VSAT Ka- are based on a unique super-light, high performance Ka-band VSAT platform designed to deliver best in class performance on Inmarsat’s new Global Xpress® network world-wide or on Telenor Satellite Broadcasting’s THOR 7 High Throughput Satellite (HTS) services in Europe. Sharing the same advanced design and lightweight carbon fiber composites/aluminium construction, the SAILOR 60 GX and SAILOR 600 VSAT Ka- weigh just 82 lbs/37 kg. While being some of the lightest Ka-band antennas in the 60cm class, both retain the performance and reliability of larger SAILOR VSAT and GX antennas, already recognised as leading technology solutions for maritime broadband. For yachts and motorboats with space restrictions, SAILOR 600 VSAT Ka- and THOR 7, and the combination of SAILOR 60 GX, SAILOR FleetBroadband and Inmarsat Fleet Xpress meet the demand from owners, guests and crew for maritime Internet closer to that experienced on land. Joining the Cobham SATCOM VSAT antenna portfolio, which includes 100cm (39.37 inches) class antenna systems for the new Inmarsat and Telenor Ka-band HTS services, the smaller, lighter SAILOR 60 GX and SAILOR 600 VSAT Ka- are easily lifted or carried onto a yacht and installed without taking up too much precious space. This can reduce installation costs and the use of modern, lightweight materials does not affect performance. In fact, like all SAILOR VSAT antennas, SAILOR 60 GX and SAILOR 600 VSAT Ka- offer class leading RF performance, which ensures high reliability and availability of broadband on board. 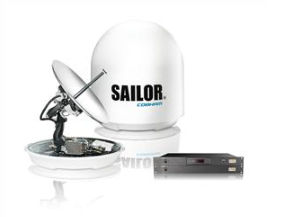 Cobham SATCOM's SAILOR 600 VSAT ka. The SAILOR 60 GX and SAILOR 600 VSAT Ka- also introduce other significant installation benefits, especially for recreational vessels, which can now operate smarter through harnessing the power of HTS services. The optimal size/performance balance of Cobham SATCOM’s new antennas is possible because HTS services use spot beams instead of wide beams, so with advanced engineering and software design, they can operate anywhere in the satellite footprint and provide a strong link to the satellite. Installation of both new antenna systems is easy, with features and details unique to the SAILOR VSAT technology platform, including a single cable between antenna and below deck equipment for RF, power and data, Automatic Azimuth Calibration and Automatic Cable Calibration. Both antennas come pre-configured for their specific satellite network, which enables ‘one touch commissioning’, meaning they can be online in seconds with no requirement to contact the Network Operations Center (NOC). Additionally, the use of Dynamic Motor Brakes inside the antennas removes the requirement for mechanical brake straps, ensuring antenna balance in no-power situations at sea or during transport. “We’re pleased to bring our unique new antennas to Fort Lauderdale, following a successful initial showing to the European boating market. With SAILOR 60 GX US boat owners can now consider moving to the high throughput broadband connectivity offered by Global Xpress, and enjoy speeds and reliability close to that delivered using much larger VSAT antennas, wherever they are in the world. 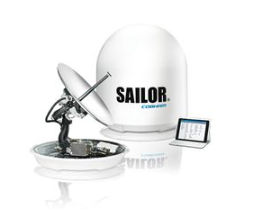 With SAILOR 600 VSAT Ka-, anyone making a summer Atlantic crossing, or who has a boat stationed in Europe can choose the same connectivity benefits in the Med, North Sea or Scandinavia using the THOR 7 service,” says Jens Ewerling, Director, Maritime Broadband, Cobham SATCOM.